Live baits can appeal to everything from largemouth bass to panfish, and the saltwater species that occasionally venture into sweet water, such as snook and tarpon. Wild shiners are a top choice here, and can be caught with small hairhooks baited with bread balls. Store-bought hatchery shiners are considered second-best for bass. Panfish such as bluegill prefer insects like live crickets, or earthworms, which are commonly in bait shops. Live shiners for bass and smaller Missouri minnows (for speckled perch) are sold by the dozen in many bait shops. Broad bait classifications include live, fresh-dead and frozen. The universal bait inshore is shrimp, which can be bought live fresh-dead or frozen. Shrimp can be fished alone on a hook (free lined), under a float, or weighted with a sinker or pinned to a jig head for bottom species. Other baits include frozen clams, live mullet, live crabs, and sand fleas for inshore or surf fishing. In blue water (deep sea), anglers often catch live their own baitfish, such as thread herrings, blue runners, scaled and Spanish sardines, or pinfish before heading offshore, but many prefer to buy and troll with fresh, rigged ballyhoo, eels, Spanish sardines, finger mullet and other fresh-dead baits. Spinning, spin-casting, baitcasting and fly tackle can be used while exercising your freshwater fishing license. Line testing in the 4- to 12-pound-test class matched to light-to-medium rods handle largemouth bass, and fly fisherman after panfish prefer light rods in the 3-to 5-weight class. Heavier fly rods, 6- to 9-weights, are more suited to bigger flies that bass like and are better to fight a bass in heavy cover. In saltwater, rods and reels are a matter of preference, but should be sized and rated for the size of fish sought, and secondly, for the weight of the baits or lures used. Salt water species also get bigger, and fight harder, so a smooth reel drag is a must. Spinning tackle for inshore saltwater fishing is normally in the 6- to 15-pound class (line test), and offshore, 20- to 25-pound spin outfits are needed. Anglers who prefer baitcasting gear opt for 10- to 15-pound outfits for inshore fishing. Surf anglers need longer rods in the 10- to 12-foot range to make long casts in the surf with heavy sinkers that hold bottom. Offshore (deep sea) reef fishing or trolling calls for heavy geared conventional reels and stout rods that can handle big fish that make long runs or must be wrestled off the bottom. Fly fishermen use rods in the 7- to 13-weight class, depending on which species they target. Inshore, an 8-weight fly rod is most versatile for smaller fish, though bigger game such as tarpon, big snook and trophy redfish call for a 10-weight at the minimum. Offshore, a 10- to 11-weight rod is best. Depending on where you go fishing, temperatures can be very hot or bone-chillingly cold, and the temperature can change quickly, so dressing in layers is advised when you&apos;re on a fishing trip. Though it's the swimsuit season on boats, summertime primarily calls for sun protection, and that means covering up, along with the liberal use of a waterproof sunscreen with a sun protection factor (SPF) of at least 15 and preferably 30 to 50. Long-sleeved, lightweight shirts and pants are available with built-in SPF ingredients in the fabric. They are designed to breathe and wick away moisture from the wearer's skin, providing comfort on hot, humid days. Sun gloves are also advised to prevent skin damage that leads to skin cancer. Good polarized sunglasses that block damaging ultraviolet sun rays protect your eyes. Wide-brimmed hats with attached collar hoods provide maximum coverage, and many anglers now wear lightweight, stretchable face masks, such as buffs that offer maximum sun protection, and also cut down on wind burn on cold days. Boat shoes that are designed to dry quickly by means of mesh fabric and drain systems provide cushion from rough boat rides and grip on wet boat decks, thus decreasing chances of injury. If you take aboard a cell phone (and you should if fishing within phone signal reach), a camera or video gear to record your fishing trip, it must be protected. And that goes double if you are wade-fishing, surf fishing, or are out on a rainy day, or out on a boat on a windy day when salt spray douses you. Consider buying one of the many waterproof phone cases on the market, and a waterproof and shockproof camera case and store it securely in a dry storage hatch until needed. All boats, from canoes and kayaks to sportfishers, must comply with U.S. Coast Guard regulations in regards to safety equipment. The regulations can be found at: www.uscgboating.org. Other equipment can include spare starting battery, GPS chart plotter, depth finder, and on larger boats that venture offshore, a radar unit especially when fishing at night, or in inclement weather. Spare spark plugs, and a tool kit for basic outboard or inboard engine repair is prudent, as is carrying spare bulbs for navigational lights and spare fuses and electrical tape for electronic control switches, too. Many boaters even carry spare hose lines for bilge pumps and livewells. A spare anchor and line is also a good idea in the event that you lose one on rocky bottom. 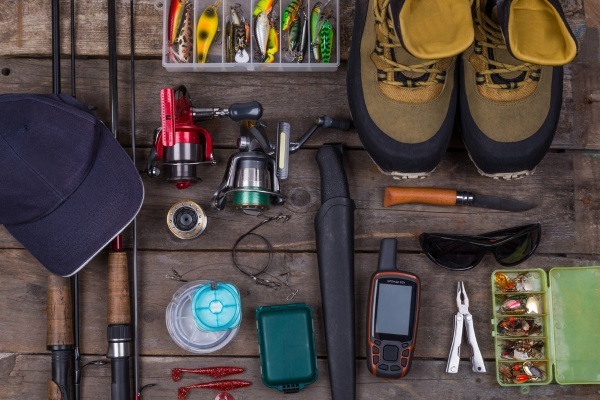 A good first-aid kit is essential for fishing – and for enhanced emergency hailing ability, consider a satellite phone, which can also be rented for the occasional long-distance fishing trip anywhere on the planet, and an EPIRB (emergency position indicating radio beacon) as well. EPIRBs are designed with a GPS receiver and two transmitters that operate at different frequencies. Once activated, both transmitters send the location signal, which can be received by both rescue boats and aircraft. Other safety equipment is covered by the Coast Guard regulations. Outside of Coast Guard required safety equipment, fishermen should carry multiple lights, such as a halogen beam spotlight for signaling and locating navigational markers, and small head lamps for everything from working on boat repairs to fishing at night.